We all know the importance of guarding your skin with sunscreen, but what about protecting your eyes on these long, bright summer days? When I think about shielding my peepers with sunglasses, it’s mostly from a style perspective: Can I really pull off those trendy oversize frames? But really, sunglasses should be seen as a health topic. “We should all be protecting our eyes from both visible light and UV light, throughout our lifetimes, because [sun exposure] can damage structures in the cornea, the lens of the eye and the retina, as well as the skin around the eyes or eyelids,” says Michael Repka, a professor of ophthalmology at the Johns Hopkins University School of Medicine. He notes that studies have shown that ultraviolet exposure can result in increased risk for a range of vision-related problems, from heightened sensitivity to light and irritation to cataracts andpossibly macular degeneration and skin cancers on the eyelid. Indeed, at my last yearly eye exam, my ophthalmologist informed me that I’d developed pingueculum, small changes to the surface of the eye that look like tiny yellow spots, probably due to chronic UV exposure — perhaps the result of a three-year stint living on a small island, during which I spent a lot of time on boats and only infrequently donned shades. Luckily the condition isn’t usually serious, but my doctor said wearing sunglasses would help prevent it from getting worse. Eye protection is important all year long, no matter the weather. “Thirty-one percent of UV light still comes through on cloudy days,” says Dora Adamopoulos, an optometrist in Alexandria, who adds that snow-covered surfaces reflect up to 80 percent of UV rays, as opposed to the quarter that are reflected off sand or water. And certain people run an elevated risk for UV damage, says District optometrist Michael Rosenblatt, who points out that those of us with light-colored irises are particularly susceptible: “If you easily burn in the sun, you should think of yourself as a person who suffers greater damage from UV light in all areas, including your eyes.” Geography is another factor, with people living in the south and at higher elevations tending to get the greatest levels of UV exposure. Children are also a major concern. “It amazes me that kids go to the beach and their moms are spraying on all this suntan lotion, but they’re running around with no sunglasses on,” says Rosen-blatt. He says that not only are young ones outside often, but that their pupils are larger than adults’ and that, unlike adults, their lenses aren’t able to filter out some UV rays. So just as with skin exposure, “by the time you’re 18 or so, you’ve pretty much done most of the sun-related damage to your eyes,” says Adamopoulos. That’s not to say that these experts are unsympathetic to the challenges of trying to get children to don shades — children such as my 2-year-old, whose new favorite game involves ripping off his tiny sunglasses and hat as soon as I put them on him, throwing them on the ground, running away and then repeating this action about a thousand times during any park, beach or pool outing. “But you’ve just got to try,” says Rosenblatt. The best thing we can do to protect ourselves from the cumulative effects of UV exposure on the eyes is to buy properly fitting, comfortable, quality sunglasses — and then wear them as much as possible, along with a wide-brimmed hat. Rosenblatt, for one, recommends frames that extend from the eyebrow to the cheek and wrap around the contour of face, along with lenses that have 100 percent UVA and UVB protection. He also points out that while some contact lenses come with different levels of UV coating, they should all still be worn with sunglasses. Also be aware that specialized sunglasses can help when you’re engaged in outdoor pursuits such as skiing, sailing or even biking, says Adamopoulos. He says that yellow- and brown-tinted lenses are best on the water, for example, while gray, brown and amber tints work well for field activities, and mirrored coatings are good for snow sports; polarization is a lens treatment that can help reduce glare. 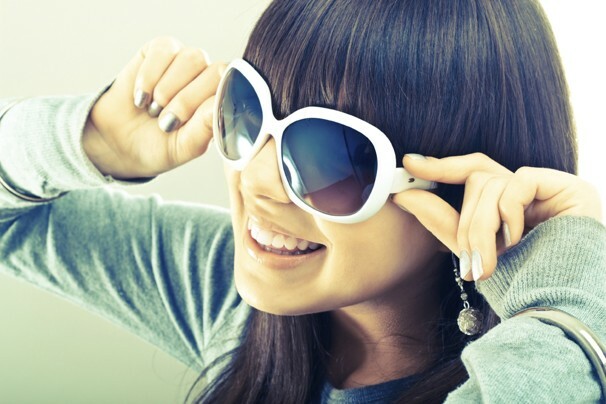 In general, darker isn’t necessarily better, if the lenses don’t have proper UV protection. Says Adamoponous: “You can actually damage your eyes if there isn’t proper UV coverage, because darker lenses cause your pupils to get bigger to see,” which results in increased UV exposure in the retina. As for the cost of sunglasses, know that you don’t always get what you pay for. “Sometimes the most expensive glasses are worse than cheapest, in terms of filtering UVA and UVB light,” explains Repka, so checking those sticker labels on lenses about UVA and UVB protection is key. I just invested in a pricey pair of designer, Jackie O-style sunglasses with polarized lenses that seem to make the world appear quite a bit crisper, as if my vision has actually improved. My hope is that looking good will inspire me to wear them more often — and inspire my kids to follow suit with their own shades. If not, at least I can count on the cardio benefits of chasing after my little one with his sunglasses and hat.